Gaylord fled when the Nov. 8 fire broke out and decimated the town of 27,000. An animal rescuer who responded to Gaylord’s request to check on Madison first spotted the male Anatolian shepherd mix several days later. 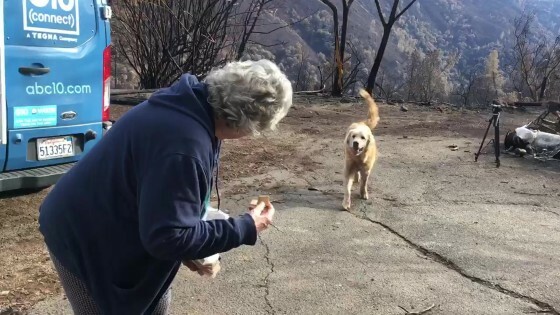 “If [the evacuees] can’t be there, I’m going to be and I’m not going to give up on their animal until they can get back in,” Sullivan said. She also helped locate Madison’s brother Miguel, another Anatolian shepherd mix that was taken to a shelter 85 miles away in the confusing aftermath of the wildfire. Gaylord told news station ABC10 she couldn’t ask for a better animal. “Imagine the loyalty of hanging in in the worst of circumstances and being here waiting,” she said.